FYI: The Rink at the Bank of America Winter Village at Bryant Park is no longer just for skating. Until February 3, you can ride bumper cars on the ice during the attraction's new winter carnival called FrostFest—a ten-day event filled with activities. Just like in recent years, folks can don their fanciest formal wear (and skates) for the Ice Ball on Wednesday, January 30 and attend a Cozy Sweater Puppy Meet-up (aww) on Saturday, February 2. There's also live music in The Lodge by Urban Space, free fitness classes, kid-friendly events (i.e. puppet shows and "penguin" catching in the Bryant Park Fountain) and...wait for it...heated igloos! That's right, you can reserve your own bubble in the park and sip mulled wine and eat s'mores during the festival. 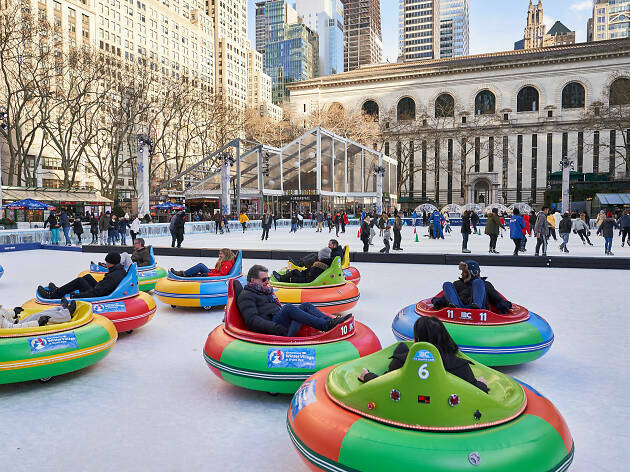 There are free activities at the Winter Village at Bryant Park every day from now until the fest ends on Super Bowl Sunday. So if you're looking for a spot to see the Patriots take on the Rams, this option is certainly classier than going to a sports bar. For more details, visit bryantpark.org.